The first new Cerebus comic since 2004! Where has Cerebus been since he died twelve years ago? Is he in hell? Purgatory? Limbo? Some strange 1980 disco with links to Close Encounters of the Third Kind and Henry Kissinger? Some ancient Greek disco with links to Plato, Socrates, Aristotle? Some 1990s disco with links to The Stone Roses, the Happy Mondays, and Oasis? Is he stuck inside his own Cerebus Online Disco Twitter-feed? Well, wherever he is, he deserves it, so feel free to laugh at his misfortune! This one shot leads into the Cerebus In Hell? 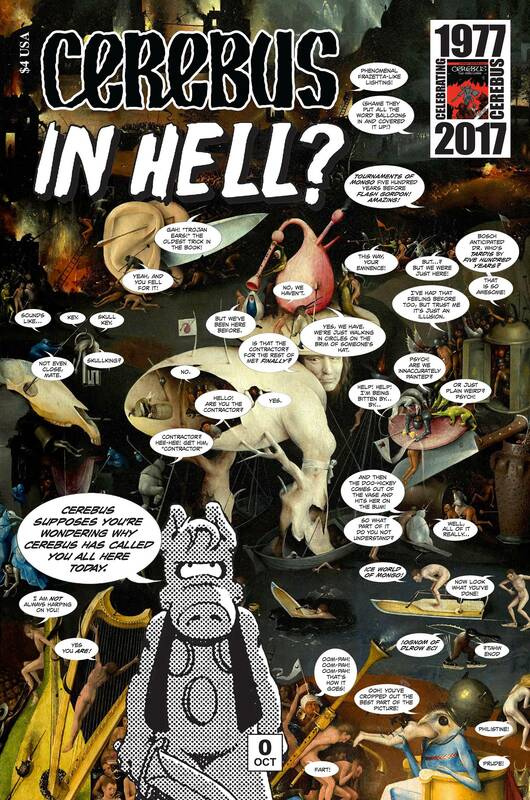 4-issue mini-series in 2017 celebrating Cerebus' 40th-anniversary!